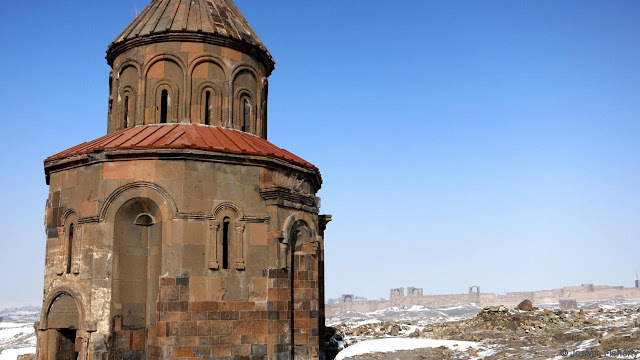 Ruled by a dizzying array of kingdoms and empires over the centuries – from the Byzantines to the Ottomans – the city of Ani once housed many thousands of people, becoming a cultural hub and regional power under the medieval Bagratid Armenian dynasty. 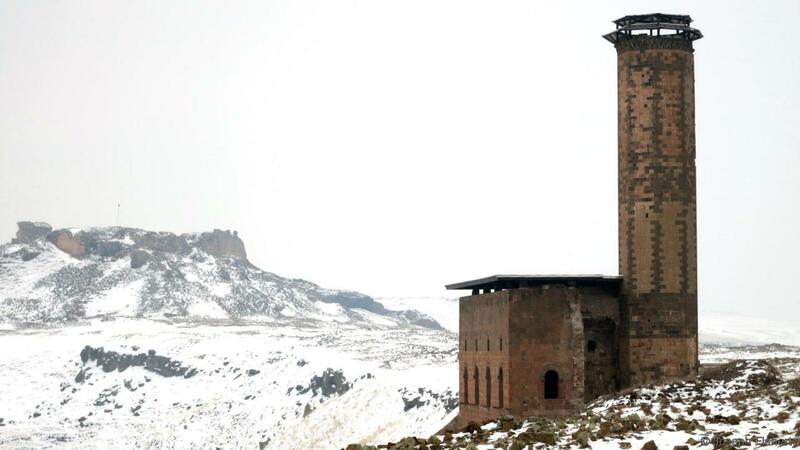 Today, it’s an eerie, abandoned city of ghosts that stands alone on a plateau in the remote highlands of northeast Turkey, 45km away from the Turkish border city of Kars. As you walk among the many ruins, left to deteriorate for over 90 years, the only sound is the wind howling through a ravine that marks the border between Turkey and Armenia. 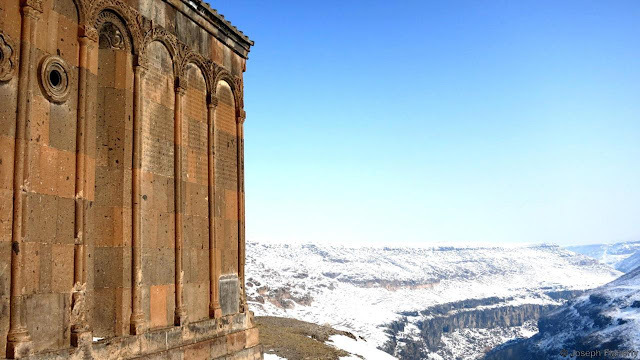 Visitors who pass through Ani’s city walls are greeted with a panoramic view of ruins that span three centuries and five empires – including the Bagratid Armenians, Byzantines, Seljuk Turks, Georgians and Ottomans. 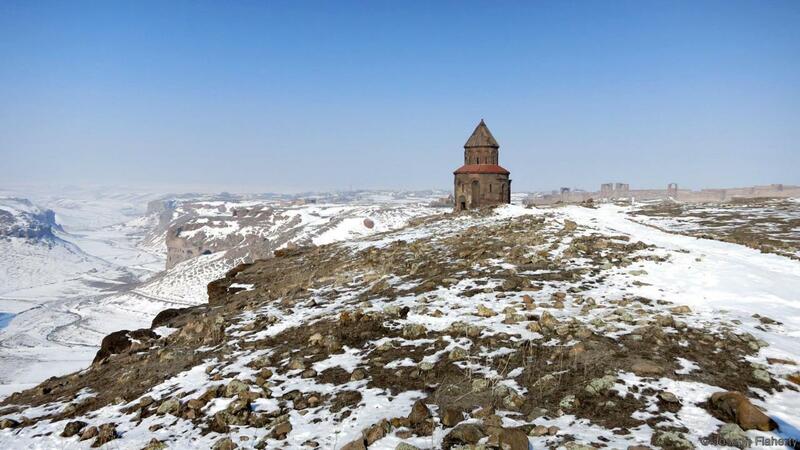 The Ani plateau was ceded to Russia once the Ottoman Empire was defeated in the 1877-78 Russo-Turkish War. After the outbreak of World War I, the Ottomans fought to take back northeast Anatolia, and although they recaptured Ani and the surrounding area, the region was given to the newly formed Republic of Armenia. 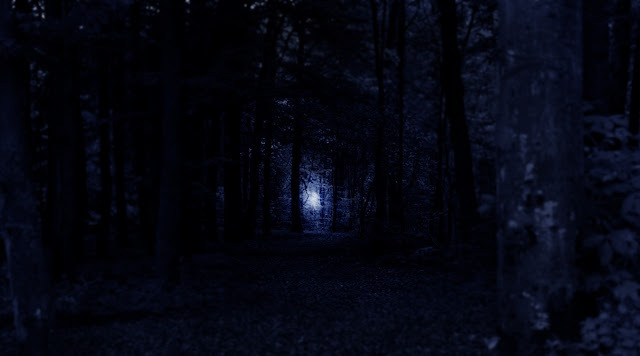 The site changed hands for the last time after the nascent Turkish Republic captured it during the 1920 eastern offensive in the Turkish War of Independence. 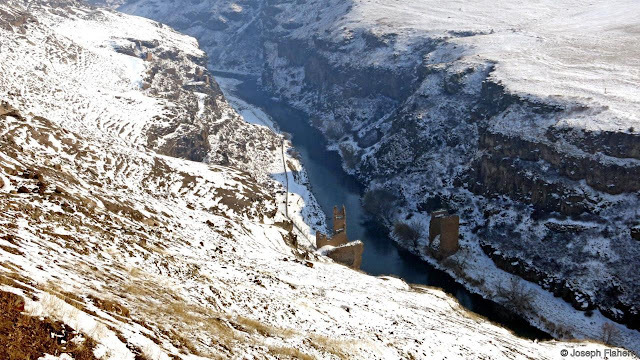 The ruins of an ancient bridge over the Akhurian River, which winds its way at the bottom of the ravine to create a natural border, are fitting given the vexed state of Turkish-Armenian relations. The two countries have long disagreed over the mass killings of Armenians that took place under the Ottoman Empire during World War I, and Turkey officially closed its land border with Armenia in 1993 in response to a territorial conflict between Armenia and Turkey’s ally Azerbaijan. 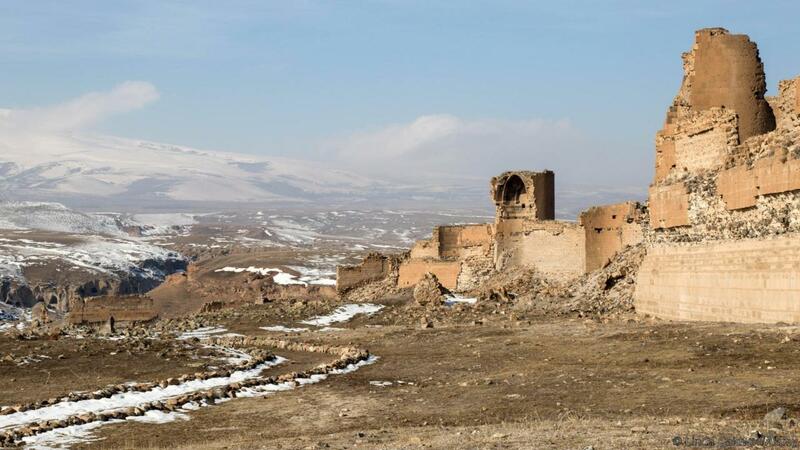 Although the focus on Turkish-Armenian tension preoccupies most discussion of Ani, there’s an ongoing effort by archaeologists and activists to save the ruins, which have been abandoned in favour of more accessible and less historically contested sites from classical antiquity. Historians have long argued for Ani’s importance as a forgotten medieval nexus, and as a result, Ani is now on a tentative list for recognition as a Unesco World Heritage Site. 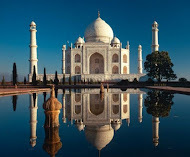 With some luck and careful restoration work, which has begun in 2011, they may be able to forestall the hands of time. At its height during the 11th Century, scholars estimate that Ani’s population reached as high as 100,000 people. Artistic renderings based on the site’s archaeological findings show a bustling medieval centre crowded with myriad homes, artisanal workshops and impressive churches scattered throughout. Known as “The City of 1,001 Churches”, Ani’s Armenian rulers and city merchants funded an extraordinary number of places of worship, all designed by the greatest architectural and artistic minds in their milieu. Although the nickname was hyperbole, archaeologists have discovered evidence of at least 40 churches, chapels and mausoleums to date. 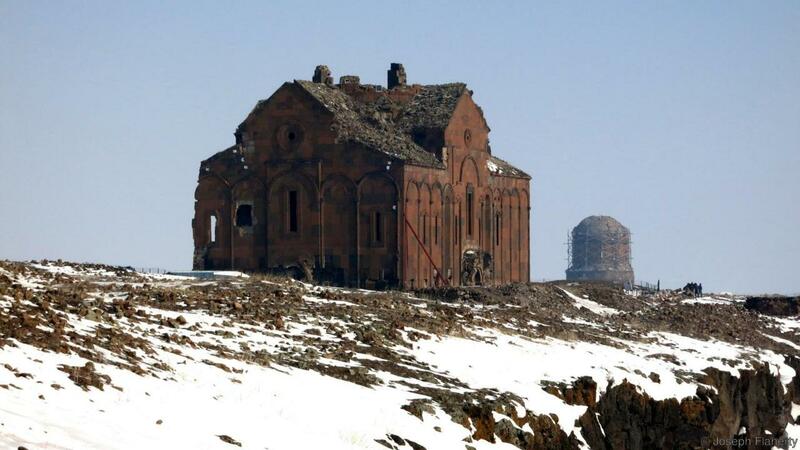 A rust-coloured brick redoubt, the Cathedral of Ani looms over the now-abandoned city. Although its dome collapsed in an earthquake in 1319 – and, centuries later, another earthquake destroyed its northwest corner – it is still imposing in scale. It was completed in 1001 under the reign of Armenian King Gagik I, when the wealth and population of Ani was at its peak. Trdat, the renowned Armenian architect who designed it, also served the Byzantines by helping them repair the dome of the Hagia Sophia. Only one half of the Church of the Redeemer remains – a monument to both the artistic prowess of the Armenian Bagratid Dynasty and the inevitability of time. Propped up by extensive scaffolding now, the church was an impressive architectural feat when it was built. It featured 19 archways and a dome, all made from local reddish-brown volcanic basalt. The church also housed a fragment of the True Cross, upon which Jesus was crucified. The church’s patron, Prince Ablgharib Pahlavid, reportedly obtained the relic during a visit to the Byzantine court at Constantinople. Built sometime in the late 10th Century, the Church of St Gregory of the Abughamrentsis a stoic-looking, 12-sided chapel that has a dome carved with blind arcades: arches that are purely for embellishment instead of leading to a portal. In the early 1900s, a mausoleum was discovered buried under the church’s north side, likely containing the remains of the church’s patron, Prince Grigor Pahlavuni of the Bagratid Armenians, and his kin. Unfortunately, like many of the sites at Ani, the prince’s sepulchre was looted in the 1990s. Opposite the Church of St Gregory of the Abughamrentsare a series of caves dug out of the rock, which some historians speculate may predate Ani. 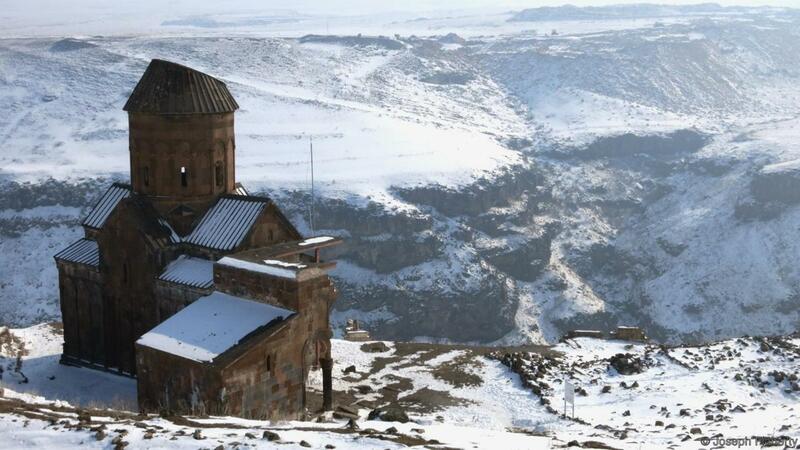 The caves are sometimes described as Ani’s “underground city” and signs point to their use as tombs and churches. In the early 20th Century, some of these caves were still used as dwellings. The Church of St Gregory of Tigran Honents is one of Ani’s best preserved buildings, adorned with remnants of paintings depicting scenes from the life of Christ and St Gregory the Illuminator. Detailed fresco cycles did not ordinarily appear in Armenian art of the era, leading scholars to believe the artists were most likely Georgian. The Seljuk Empire – a Turkish state in Anatolia that drove out the Byzantines and eventually gave way to the Ottoman Empire – controlled the greater area of what is today northeast Turkey and Armenia beginning in the mid-1000s. However, in 1072, the Seljuks granted control of Ani to an Islamic dynasty of Kurdish origin, the Shaddadids. The Shaddadids, in turn, left their mark on Ani with buildings like the mosque of Manuchihr, which is perched precariously on the edge of the cliff. Its minaret is still standing from when the mosque was constructed in the late 1000s; the rest of the mosque is most likely an addition from the 12th or 13th Centuries. The original purpose of the mosque of Manuchihr is debated on both the Turkish and Armenian sides. Some contend that the building once served as a palace for the Armenian Bagratid dynasty and was only later converted into a mosque. Others argue that the structure was built as a mosque from the ground up, and thus was the first Turkish mosque in Anatolia. From 1906 to 1918, the mosque served as a museum of findings from Ani’s excavation by the Russian archaeologist Nicholas Marr. Regardless of the building’s origins, the mosque’s four elegant windows display spectacular views of the river and the other side of the gorge. Ani’s city walls may seem ready to crumble, but when they were constructed in the 10th Century, they made for a formidable defence. The Bagratid family of kings built them in order to fortify their new capital and, over the centuries, they protected the city’s occupants against siege after siege by various armies. These ramparts, along with Ani’s inhabitants, witnessed bloody conflicts between the Bagratids and the Byzantines, and the Byzantines and the Seljuks. 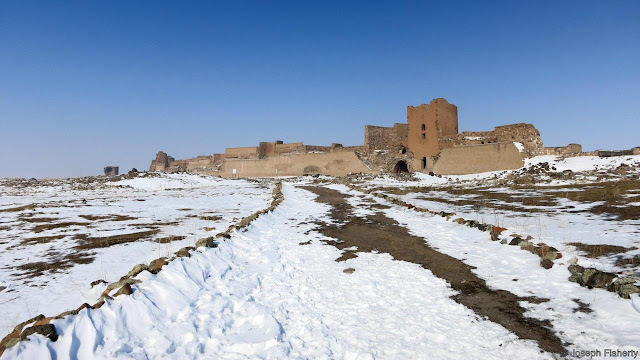 Despite Ani’s history as a field of warfare, the ruins also represent many periods throughout history where the city saw a remarkable interchange of cultures, religions and artistic motifs.